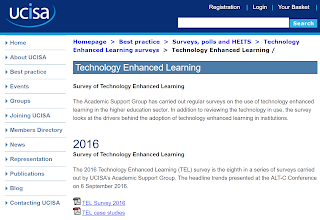 These two reports give a status of TELearning in 2016: one analysing the Technology Enhanced Learning for Higher Education in the UK (233 pages, with appendixes starting at page 78) and case studies of Technology Enhanced Learning (48 pages, with nice examples). I give a brief summary below. The reports were produced by UCISA (Oxford univesity based network) representing many major UK universities and higher education colleges and it states to have a growing membership among further education colleges, other educational institutions and commercial organisations interested in information systems and technology in UK education. The used definition of TELearning is: "Any online facility or system that directly supports learning and teaching. This may include a formal VLE (virtual learning environment), e-assessment or e-portfolio software, or lecture capture system, mobile app or collaborative tool that supports student learning. This includes any system that has been developed in-house, as well as commercial or open source tools." Top 5 challenges facing institutions: Staff Development is the most commonly cited challenge, Electronic Management of Assessment, lecture capture/recording continues to move up, technical infrastructure, legal/policy issues. Factors encouraging the development of TELearning: Enhancing the quality of learning and teaching, meeting student expectations, improving student satisfaction are most common driver for institutional TEL provision. Availability of TEL support staff, encourages the development of TEL, feedback from students, availability and access to tools, school/departmental senior management support. In terms of barriers for TELearning: lack of time, development & consolidating, culture continues to be a key barrier, with Departmental\school culture, and Institutional culture, internal funding, and lack of internal sources of funding to support development. Strategic questions to ask when considering or implementing TELearning: with Teaching, Learning and Assessment consolidating, the rise of the Student learning experience/student engagement strategy, corporate strategy and library and Learning Resources. TELearning currently in use: main institutional VLE remains Blackboard and Moodle. Moodle remains the most commonly used platform across the sector, but rising alternative systems such as Canvas by Instructure, and new platforms eg. Joule by Moodlerooms. SharePoint has rapidly declined. An increase in the number of institutions using open learning platforms such as FutureLearn and Blackboard’s Open Education system. Evaluation activity in reviewing VLE provision: conducting reviews over the last two years. 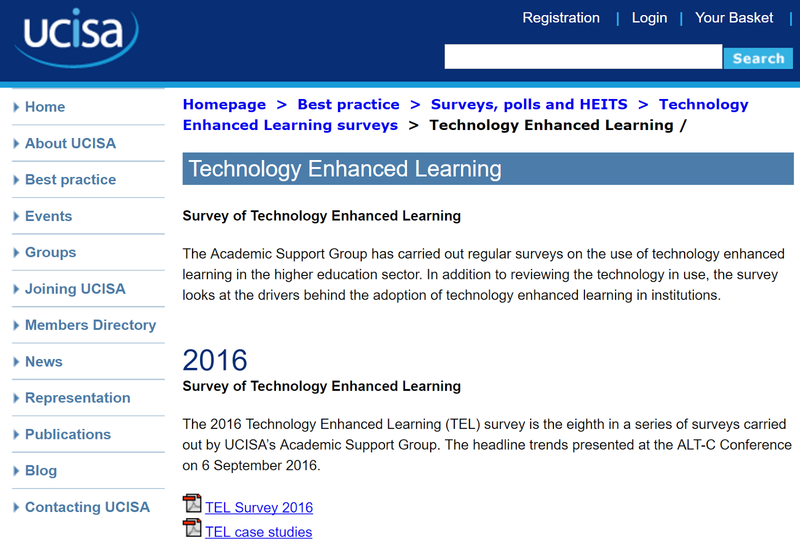 TEL services such as lecture capture is the second most commonly reviewed service by all over the last two years. capture tools. Podcasting tools continue to decline in popularity and the new response items electronic exams and learning analytics appear not to be well established at all as institutional services, with only a handful of institutions currently supporting services in these areas. Social networking, document sharing and blog tools are the common non-centrally supported tools. TEL tools are being used to support module delivery. Blended learning delivery based on the provision of supplementary learning resources remains the most common use of TEL. Only a small number of institutions actually require students to engage in active learning online across all of their programmes of study. Increasing institutional engagement in the delivery of fully online courses, with over half of 2016 respondents now involved. Growing adoption of MOOC platforms by institutions, but less than half of respondents are pursuing open course delivery. Little change in the range of online services that higher education institutions are optimising for access by mobile devices. Access to course announcements, email services and course materials and learning resources remain the three leading services optimised for mobile devices. Library services, are being optimised. Optimising lecture recordings at the same level as 2014. The most common ways in which institutions are promoting the use of mobile devices are through the establishment of a bring your own device (BYOD) policy and by loaning out devices to staff and students. Funding for mobile learning projects has reduced in scale. Outsourcing of institutional services grows: student email, e-Portfolio systems, VLEs and staff email. 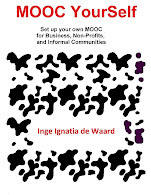 The type of outsourcing model is dependent on the platform being outsourced: Software as a Service (SaaS) cloud-based model for email services, and to use an institutionally managed, externally hosted model for TEL related tools, such as e-Portfolios and the VLE for blended and fully online courses. Electronic Management of Assessment (EMA) making the most demand on TEL support teams. Lecture capture and Mobile technologies as well. The demand from Learning Analytics and from distance learning/fully online courses continues to increase. 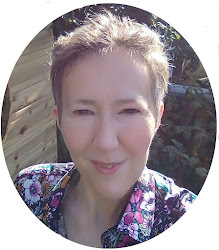 A new entry which might be expected to make more demands in the future is Accessibility; in particular, demands made by changes to the Disabled Students’ Allowance in the English higher education sector. A number of appendixes: full data, a longitudinal analysis of TELearning over the past years (going back to 2001), questions that were used for the longitudinal analysis. These case studies are a companion to the earlier report mentioned above. The idea is that the case studies enable to probe themes in the data and shed light on TEL trends through the eyes of representative institutions, offering context to the findings of the overall report. In each of the case studies, the institutions provide answers to the following TELearning sections: used TELearning strategy, TEL drivers, TEL provision, TEL governance and structures, TEL-specific policies, Competition and Markets Authority (CMA) strategy, Teaching Excellence Framework, Distance Learning and Open Learning, and Future challenges. The diversity of institutes interviewed give a good perspective of the TEL landscape within Higher Education in the UK. I was working on a blogpost on books focusing on EdTech people (the woman, the tasks…), but then I opened up YouTube and I saw that president Trump had his first solo press conference. 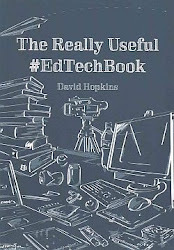 I guess we can all benefit from Mike Caulfield's ebook (127 page) on web literacy for students (online version) or here for other versions including pdf), a fabulous book with lots of links and useful actions to become (more) web literate (thank you Stephen Downes for bringing it to my attention). After watching it, I thought there was a clear need (for me as an avid supporter of education) to refer to initiatives on the topic of real and fake news, because honestly I do not mind if someone calls something fake or real, as long is that statement is followed by clear arguments describing what you think is fake about it, and why. Before doing that, I want to share the reason for this shift in attention. I love Amerika, for several reasons: where Europe stays divided, the United States have managed to get its nations to work together, while leaving enough federal freedom to adapt specific topics according to individual nation’s believes; I have worked and honestly like to work with Americans (of all backgrounds) and American organisations, truly I am in complete awe of the Bill of Rights, and the way the constitution is securing freedom for all. I know that a goal as ‘freedom for all’ is difficult to attain, but at least it is an openly set vision, put on paper. I mean, I truly respect such strong incentive to promote freedom for all citizens within a legal framework and the will to achieve that freedom. And due to this love for the United States, I felt that Trump is okay. In democratic freedom, the outcome might not be of anyone’s liking, but … history has shown that democratic freedom can swing in a lot of ways and that it this diversity nurtures new ideas and insights along the way. However, while watching the press conference I got more and more surprised by what was said and how: there were clear discriminatory references, which I do not think befit a President of all the American people. But okay, to each his own and rhetorical styles can differ (wow, can they differ), but the ongoing remark and reference on Fake News that kept coming up as an excuse and used as a non-sequitur at any point during the press conference just got to me. Manipulation has many faces, and only education can help built critical minds that will be able to judge for themselves, and as such be able to distinguish real from fake news. To me, even if you refer to ‘this is fake news’, I want to hear just exactly what you mean: which part of what news is fake and why. Enlighten me would be the general idea. Teaching information literacy, the process of determining the quality and source of information, has been an emphasis of the American Association of School Librarians for decades. However, teaching of information literacy in school has declined as the number of librarians in schools has declined. Luckily, there are some opinions and initiatives on distinguishing between fake and real news. Danah Boyd had another look at the history of media literacy, focusing on the cultural context of information consumption that were created over the last 30 years. Danah shared her conclusions in a blogpost on 17 January 2017, entitled 'Did media literacy backfire?' 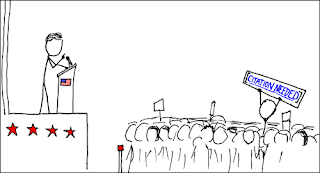 She concluded that media literacy had backfired, in part as it was built upon assumptions (e.g. only media X, Y and Z deliver real news) which often does not relate to the thinking of groups of people that prefer other news sites A, B and C.
The cultural and ethical logic each of us has, is instilled in us from a very early age. This also means we look upon specific thinking as being ‘right’ or ‘wrong’. And to be honest, I do not feel this cultural/ethical mind set will deter all of us from being able to become truly media literate. As long as we talk to people across the board. As long as colliding thoughts fuel a dialogue, we will learn from each other and be able to understand each other in better ways (yes, I am one of those people that think that dialogue helps learning, and results in increased understanding, thank you Socrates). If this is the case, than we need to do a better job of improving media literacy, including listening to people with other opinions and how they see it. It is a bit like the old days, where the people from the neighborhood go to the pub, the barbershop, or any get together were people with different opinions meet, yet feel appreciated even during heated debates. Maha Bali, in her blogpost “Fake news, not your main problem” touches on the difficulty of understanding all levels of the reports provided in the news and other media. Sometimes it does demand intellectual background (take the Guardian, I often have to look up definitions, historical fragments etc. to understand a full article, it is tough on time and tough to get through, but … sometimes I think it is worth the effort). Maha Bali is a prolific, and very knowledgeable researcher/educator. She touches on the philosophical implication of ‘post-truth’ and if you are interested, her thesis subject on critical thinking (which she refers to in her blogpost) will probably be a wonderful read (too difficult for me). So, both Maha and Danah refer to the personal being not only political, but also coloring each of our personal critical media literacies. If media literacy depends on personally developing skills to distinguish fake (with some truth in it) from real (with some lies in it), I gladly refer to some guidelines provided by Stephen Downes, as they are personal. One of the statements I would think is pivotal to distinguish between fake and real news, is understanding that truth is not limited to one or more media papers/sites/organisations, it is about analysing one bit of news at a time. It is not the organisation that is authoritative at all times, it is the single news item that is true or at least as real as it can get. So, here is a list of actions put forward by Stephen Downes on detecting fake news : Trust no one, look for the direct evidence (verification, confirmation, replication, falsification), avoid error (with major sources of error being: prediction, relevance, precision, perspective), take names (based on trust, evidence and errors), and as a final rule he suggests to diversify in sources (which I really believe in, the pub analogy). Another personal take on detecting fake news comes from Tim O'Reilly who describes a personal story, and while doing so he sheds some light on how an algorithm might be involved. In my view, the increase in accepting the idea of fake news is related to the increased divide within society. So, in a way I agree with Danah Boyd: we read and agree with specific people and news sources, and so we filter our sources to those people and media. Seldom do we read up on sources from media we do not agree with, or people we disagree with. It used to be different, as discussions around specific topics were discussed in our community, with a mix of ideas and preferences. So maybe media literacy could be done on a community level, where everyone gets together and shares their opinion on certain topics. We recreate the local pub or café, where everyone meets and gets into arguments on what they believe (or not). Media literacy – to me – is about embracing diversity of opinion, listening, seeing the arguments from the other side and … making up your own mind again. So, coming back to president Trumps referencing to fake news. In terms of increasing media literacy, I do not have a problem with referencing to something that is seen as fake news, I do have a problem with that fact not being explained: what is fake about it? Why? And again, with saying that, I mean a real explanation, not simply repeating ‘this is fake news. It is. I tell you it is’ (feel free to imagine the tone of voice that such a sentence might be delivered in), now give me the facts, because I do want to know why you or anyone else is labeling something as true or false. As online learning becomes more known, the quality of the delivered online materials become more essential, as learners can (partly) decide which courses they will follow based on the quality of the course material. One of the challenges is to give teachers and trainers an idea of how instructional designers can help (IDs are schooled in online learning options) and what instructional designers can bring to the interdisciplinary learning/teaching team (a broader online and blended learning knowledge, specifically aimed at online or blended interactions, this relies on specific theoretical frameworks that facilitate practical implementations). So, being asked by EIT InnoEnergy to provide an overview of why Instructional Designers are an important Human Resource profile to ensure high quality online or digital learning material, I put together this brief presentation. The slides are text rich so course partners (SELECT) can have another look after the presentation and an ongoing conversation with local Instructional Designers might be started. In the meantime I am continuing the inspiring work on the Instructional Design Variation Matrix (a practical guide for Instructional Designers, a bit of an extended job aid).